I have heard from a number of folks in the last few days that their Windows 7 computer updated itself— uninvited— to Windows 10. 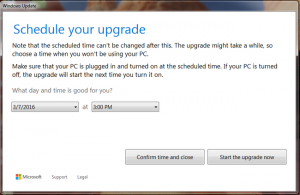 First comes a pop-up that asks you to schedule the upgrade with no option to decline. Then ready or not, Windows 10. Here are some tips to help you make your Windows 10 a bit more livable. Windows 8 was a big misstep for Microsoft. It eliminated the start menu and forced a launch screen with a jumble of colored rectangles. It traded understandable menu choices for features hidden off screen. For a phone or a tablet the grid of large rectangles functioning as buttons could have made choosing easier. But for desktop users it was horrible. 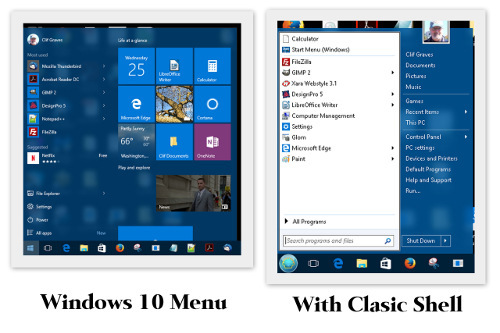 Windows 10 partially backpedals and offers to put back something like the start menu mashed up with the rectangles. A big improvement but no Windows 7. With Windows 10 you also get a lot of advertising for Microsoft’s subscription-based Microsoft Office. Traditionally you buy a box with a disk in it and install the program from the disk. After that you get to use the program for as long as you like. Current software is, on average, very good. While in the past the new version of a software package was almost always a big improvement over the last one, today big improvements to existing software packages are few and far between. Arguably the changes are mostly cosmetic to make you think it is new and worth buying. In a subscription-based model, improved or not, you have to pay every year for the software to continue working. Like leasing a car or renting an apartment, you always have a monthly or yearly bill. Consider Libre Office. 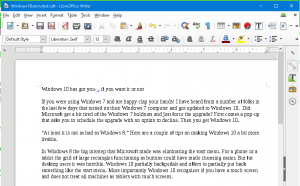 Libre Office is a free and open source Microsoft-Office comparable office suite that can read and write Microsoft Office documents. Libre Office includes Writer (word processing), Calc (spreadsheets), Impress (presentations), Draw (vector graphics and flowcharts), Base (databases), and Math (formula editing). If you use Microsoft Access, then Libre Office Base may disappoint. But in almost every way Libre Office is as good or better than Microsoft Office, and there is no subscription fee. How can great software be free? Open Source projects are the Public Radio of the software world. Both Libre Office and Classic Shell are volunteer and donation supported software. If you can support their continued development with a donation, it will help to make sure that the software is always available and always free. No geek talk computer assistance.